The Libertines should need no introduction. The band were one of the most prominent bands coming out of the revival of indie rock in the 2000s. To just put them in a group with every other band in that period would be undeserving however, considering there more rag-tag punk poetry edge (much like the Clash in areas) and the lyrical genius of both Pete Doherty and Carl Barat. The band broke up in 2004 after an infamous high profile personal feud between the songwriters and eleven years later after several reunion shows we have the “Anthem for a Doomed Youth” LP. The danger signs were flashing for this album when it was announced that Jake Gosling would be producing it considering his CV includes One Direction’s “What Makes You Beautiful” and Ed Sheeran’s album “+”. Yet, surprisingly, The Libertine’s create a fairly good LP. It is far from perfect or even great especially instrumentally but lyrically Doherty and Barat are as good as ever. 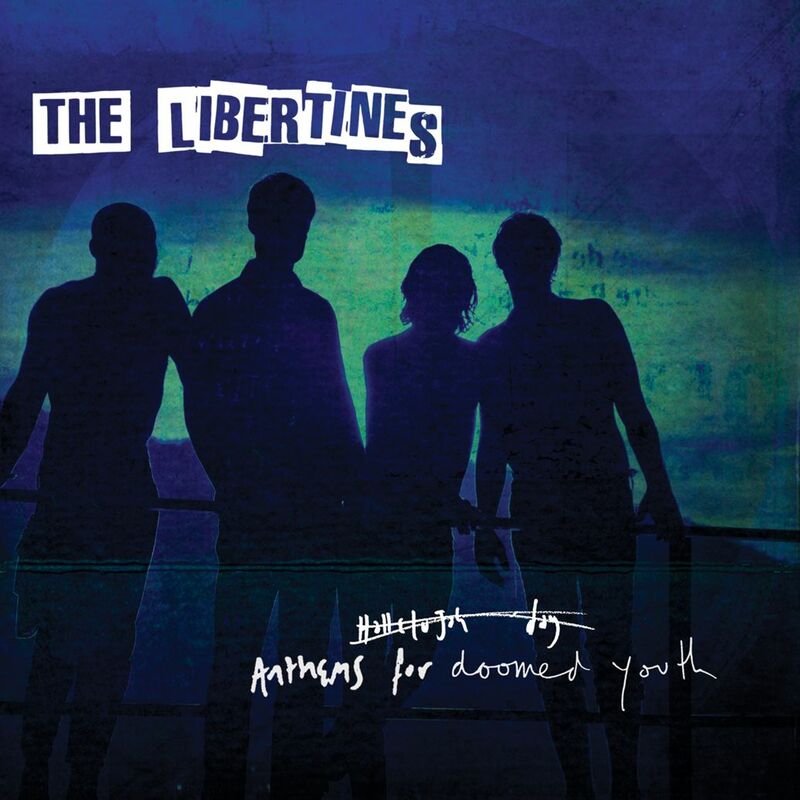 The album opener, “Barbarians” is in the vein of the Libertines we know and love but with a darker tinge in the instrumental sections between verse and chorus. It also has a bit of 60s pop feel with the cheesy “ooooos” on the chorus which has a pretty good line in typical pessimistic Libertines fashion “the world’s fucked but it won’t let me down”. The next track “Gunga Din” has a strange reggae grove which oddly fits in perfectly with Doherty’s eccentric vocal style. Yet, what the song lacks is energy; particularly in the chorus in which the reggae style of the verse disappears into a standard conventional chorus without a great deal of enthusiasm. It’s particularly noticeable considering the set up for the chorus is so good especially when Barat’s “Oh **** it, here I go again!” scream is followed up by a chorus that plainly lacks the imagination of its lyrics. This is apparent again on “Belly of the beast” or at least for the first half. In the second half they change it up and it becomes more interesting. Again, on “Glasgow Coma Scale Blues” energy is lacking. Most notably on the chorus where the vocals are on the monotonous side and the instruments just need to be turned up to eleven in order to give that rag-tag chaotic feel that so often works in the livelier Libertines songs. On “fame and fortune” the band takes some obvious influence from the Arctic Monkeys’ third album, “Humbug”. It has that same darkly mysterious circus like tone (most similar to Arctic Monkeys’ “Jewellers Hands” song) but it’s not produced to nearly the same standard. Comparatively it feels small to the encompassing atmosphere of some tracks on “Humbug”. It felt more like earlier attempts at capturing that same sound in the early 2000s where they hadn’t quite got it spot on yet, The Coral’s “Don’t Think You’re The First” from “Magic & Medicine” comes to mind. “You’re My Waterloo” is infinitely more interesting. A smoky piano accompanies some truly amazing song writing “You’ll never fumigate the demons/No matter how much you smoke/So just say you love me/For three good reasons/And I’ll throw you the rope”. The guitar solo toward the end doesn’t quite nail the emotion of the song which is bottled up and overflowing; I really wanted it to burst out of the song. That might just be because I want every guitar solo in a piano ballad to be Slash coming out of that church in the desert in “November Rain” but you can’t win them all. “Iceman” sees the band take on a much more Kinks-esk style of storytelling in acoustic style which obviously unsurprisingly suits their poetic style. At the other end of the spectrum, “Fury of Chonburi” is much heavier. It has what is lacking in some of the other tracks, real energy. “Belly of the Beast” could definitely have used some of that oomph. Lyrically it is far superior to Chonburi but it feels like the band is just going through the motions; it just feels a bit flat. The closer, “Dead for Love” is a song that sounds almost as good as it reads. An almost horror movie style piano accompanies a dark poem about love and murder. Filled with some dark and luscious imagery you can easily see it playing out as a movie script. The Libertines’ welcome return to making new music is a good one. Barat and Doherty create some incredibly clever and moving poetry at times and it is perhaps for this reason it is the ballads that are the real stand out on this LP (especially “You’re My Waterloo”). When they try to pick up the pace a bit they seem to lack the energy and imagination to match their lyrics; which of course can sometimes take away from their impactful lyrics. The first half suffers more than the second in this respect but overall it’s an impressive return after eleven years out of a recording studio together. Should they make a second album it could well be one to watch out for.